Solar LED Street Light Luminaries, offered by us, utilizes imported high quality high power white LED's which can be directly soldered with MCPC (Metal Core PCB), thus offers the best in class thermal behavior. 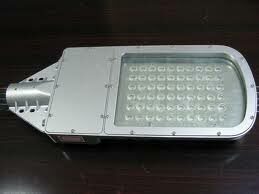 In addition to the inherent efficiency of LED's, our Solar LED Street Light Luminaries can be made very directional, casting light mostly along the roadway. Solar LED Street Light Luminaries that we provide allow good illumination, further reducing power consumption and saving more money. The Light source is housed in a water resist assembly (lP-65 Rated) and 1W LED's are arranged in MCPCB and fixed with heat sinks for better thermal management. The light output from the light source is kept constant. There is no linear variation with changes in the input voltage. Solar Street Light Luminary (LED) is ideal for street lighting, sidewalk lighting, park lighting, campus lighting, farm & ranch lighting and wildlife area lighting.